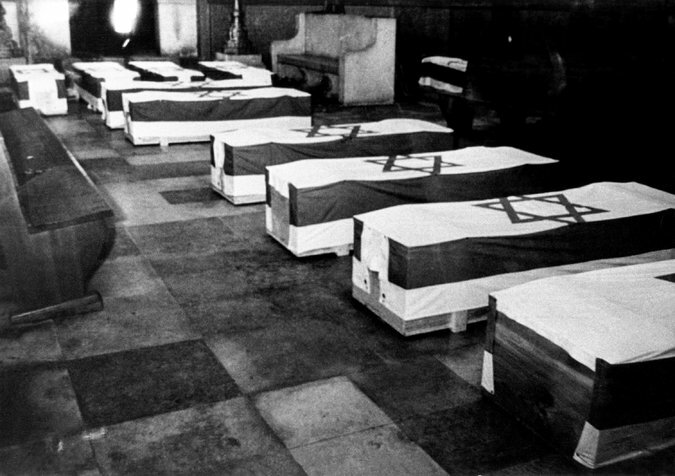 A Munich synagogue held the coffins of the victims of the attacks at the 1972 Olympics. Terrorists representing a branch of the Palestine Liberation Organization breached apartments housing Israeli athletes. In September 1992, two Israeli widows went to the home of their lawyer. When the women arrived, the lawyer told them that he had received some photographs during his recent trip to Munich but that he did not think they should view them. When they insisted, he urged them to let him call a doctor who could be present when they did. Ilana Romano and Ankie Spitzer, whose husbands were among the Israeli athletes held hostage and killed by Palestinian terrorists at the 1972 Olympics in Munich, rejected that request, too. They looked at the pictures that for decades they had been told did not exist, and then agreed never to discuss them publicly.